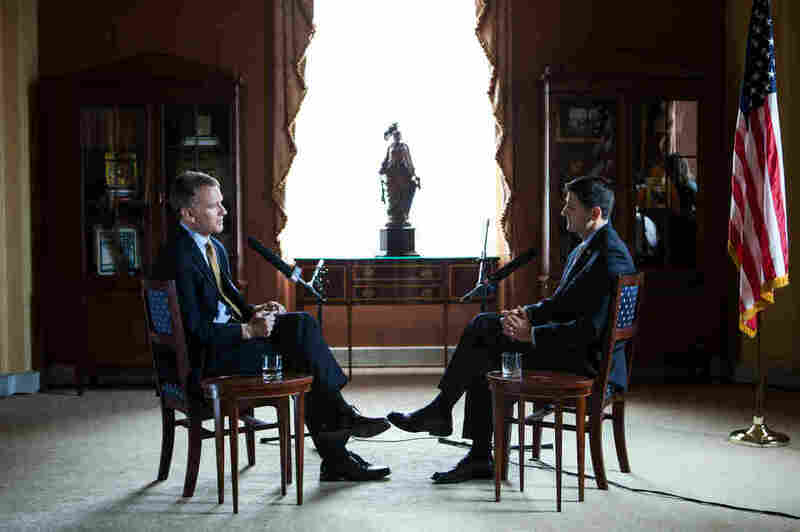 Transcript: Paul Ryan, Speaker Of The House, Talks With NPR's 'Morning Edition' NPR's Steve Inskeep interviews House Speaker Paul Ryan about his policies on poverty, his thoughts on Donald Trump — and his advice for the next Republican vice presidential candidate. House Speaker Paul Ryan spoke with NPR's Steve Inskeep. Steve Inskeep: We're sitting down in the middle of a year in which a lot of people, particularly those involved in politics, have expressed distress, have said that they don't know their party anymore, don't know their country anymore. And so I'd like to know: What if anything have you learned about the country from the presidential campaign and the events of this year that you didn't know? Paul Ryan: I've learned the country is very distressed. I took this job Oct. 29 before the presidential election got started and worked to get our party in the House to agree that we would assemble an agenda to tackle the big problems facing the country, and take it to the country. And the primary process got underway. Seventeen people — it was a big field, a lot of good, quality folks ran. And what I watched in our party was a lot of anxiety. A lot of people really distressed about the direction of the country. I then watched the same thing basically happen on the Democrat side of the aisle, which is a very competitive primary — far more competitive than I thought people were expecting. And so, I think we have a country that is kind of high-anxiety. We've had flat wages, anemic economic growth. We've got international problems, terrorism, you name it. So people are very anxious. Economically, poverty is very stubborn in that it's been stubbornly high. So what we're trying to do is be a port in the storm. The way I describe it to our colleagues is the ship of state is kind of floating all over the place right now. And our job is, we ought to see it and add a keel and a rudder to it to give it some direction. Were you surprised by extent of the anxiety? Was I surprised by what? The extent of the anxiety. Not really, only because I experience it myself. If you're a House member, you're very close to your constituents. You're very close to the voters. You're up for election every other year, so you're always out and about in your community. And because of the role I have, I'm around the country a lot. And I meet with people from all backgrounds and walks of life, and I spent the last four years touring poor communities with my friend [community organizer] Bob Woodson. Learning, listening, not with TV cameras or media. So, it was pretty clear to me that people were pretty, pretty hurting in this country and pretty anxious. So no, I wasn't surprised. It just — it just became [that] the volume and the noise level got much higher. Why is it important for you that the Republican Party make a mark on poverty? You talked about traveling to understand the problem better; it's part of your agenda that you put out. It is a part of our agenda because I think it's who we are and I think we have better ideas. The way I've always looked at these jobs as being problem solvers. And to me — I was influenced by certain people and mentors. [Late Republican lawmaker] Jack Kemp was my greatest mentor who I used to work with, and he spent a lot of his time on this issue. So at a young age I became very interested in the issue of poverty and in the issue of outreach. And so what I basically saw after doing a deep dive into just sort of the statistics of poverty and into the economics of poverty and into the policies we have, I then wanted to learn more about it on a personal level. So I asked my friend Bob Woodson, who's a poverty fighter of many, many decades, to show me poverty in America and let me, you know, teach me. So I spent a number of years doing that and I was — I loved it. I loved it in the way that I felt like there are really good answers to be had out here. And I felt like there was a great opportunity for our principles to be applied here to make a huge difference. And so the reason I think we ought to focus on poverty is because it's been a problem that's been stubborn and that we haven't fixed it. We've had a big effort. We've had a war on poverty. Trillions of dollars spent. Dozens and dozens of programs created. Yet we've kind of barely moved the needle. Some things that we've done ... I've liked the earned income tax credit. I think there are things that have worked well, but so many things we have done that sort of backfired on us. So I see a problem that can be fixed. But I also see a problem where a lot of people don't believe in the American idea anymore. The condition of your birth doesn't determine the outcome of your life. This is America, you can make it. You work hard, play by the rules, you can rise, you can do well. That's what we're taught, that's what we believe, that's what we think of as America. Problem is, there are just generations of people in this country who do not think that. Do some of the statistics that you quote, like the fact that very few people can get out of poverty if they're born into poverty, show that it's actually not the country we believed it was? No, I think that's right. So we think of the ideal and we think that that is what the country is, and then you actually go look at the country and the conditions. You're just as more likely to stay poor today as you were if you were born into poverty 50 years ago. And so we have not made the kind of mark we need to make. And so let's go back and figure out how we can get our country to reach its ideal because it is not there right now. And so, yeah, I think that that's something a lot of people have to learn. And what I look at is I see problems that can be fixed because I see solutions that are actually occurring. That's what's exciting about this issue ... because there are people in communities who are actually out there fighting poverty eye to eye, soul to soul, in neighborhoods that actually do well, that succeed. But for government, I think in many cases they can do more. And so what I want to do is make sure that in these communities we actually empower these groups, we empower these people. We take their lessons and we reapply them throughout the rest of the country. [The] violence-free zone in Milwaukee is now been applied in Racine, Wis., which is ... having mentors from former gang members. People who had hard knocks in life got rehabilitated going into schools. They have credibility and they're helping young people avoid the mistakes that they made. And we're seeing a huge decline in violence, a big increase in academic performance, and we're seeing, you know, families kind of put back together because of a homegrown idea, which started in Dallas and then got replicated in Milwaukee and now we're bringing it to Racine. And it's just something that people did organically locally. And local government, local people, local churches and community groups came together to put this to work. That's a good example of something that I think is just very interesting and exciting and inspiring that we want to replicate. Mr. Speaker, you say something a lot of Republicans have said over the years, that some Democrats have said over the years. You've argued that welfare is keeping people away from work — it disincentivizes work, as you will. One answer in the past has been simply to cut welfare. Is that what you want to do? No, I think the smarter thing to do is to customize the benefits to a person's particular needs. And that's what I learned again by traveling the country. Looking at different models that work. I'm a Catholic, full disclosure — the Catholic charities model. They do it in Fort Worth [Texas] really well. What you do is you customize a benefit to a person's particular needs so that you can make sure she has what she needs. Maybe this woman needs addiction counseling, or maybe she needs a GED, or transportation or something. You customize the benefits for her particular needs with the proper accountability: work requirements, time limits or, if she can't get a job and needs education, education. Instead of having these hard cliffs. So, as you describe it, just cutting off welfare — you know, it's sort of the cold love cutting off cliffs without actually getting a person on a path doesn't work. But tapering these benefits so that work always pays, it always makes sense to take the next step forward is the way to go. And the only way you can really do that right is to customize a benefit to a person's particular needs. That's right. So you always want it to pay. So you don't want to have what we call the poverty trap where if you take a job and you lose 80 cents on the dollar in benefits and you can't see your kids, you're not going to take that job. So you can't make it an 80-cent cliff. You can't make it an 80 percent tax rate to go to work. You have to actually taper these benefits and do it in such a way that it always makes sense to take the next step forward. And the only way you can do that is not micromanage in Washington; it is to actually customize benefits. And the way I look at this is: Let's break up the welfare monopoly, instead of having just the welfare agency at the county level give people their benefits, which they basically rubber-stamp. ... They don't actually treat the person. Let other providers also provide these full-scale wraparound benefits. Let the Catholic Church do it. Let Lutheran social services. Let America Works, a for-profit agency that's good at this. So, have a competition based on evidence, based on outcome, providing these benefits that are customized to people to get them out of poverty and on their way to success. When we've done voter interviews we find a lot of people who are working, and they're making $10 an hour. They're making a couple dollars an hour as a waitress plus tips. Why not do something that raises wages? Well, skills. So actually, I think, when you raise the minimum wage, we already showed — [Congressional Budget Office] tells us you'll lose over a million jobs in certain proposals. So you don't want to take away those entry-level jobs that get people the hard and soft skills they need just to learn how to do work. What you need to do is amplify their ability to get a better job by education, by skills training. Maybe it's technical college. Maybe it's a GED. That is where I think these benefits and the customization of benefits comes into play. Every person has a different problem. Sometimes a person has an even deeper problem, like an addiction or something like that. Paying people who are working — they get a tax credit, a straight tax payment is what you're saying. It's a lump sum at the end of the year, and so you don't sort of feel the effects of making work pay. I think we should make it a monthly or whenever your paycheck occurs, and you can do this to the Social Security system. And I think we should apply it to childless adults because that's one of the stubborn problems we have. You look at labor force participation rates, young childless adults 18 to 34 are the people who are really slipping through the cracks in this country and they're running into these cliffs. And so that's one of the things I think we could do to improve that. Can your own party deliver the votes for something like that? I've talked with people in your own party who are outraged by the earned income tax credit, it's just a straight payment to people. I think they're outraged at the fraud rate, which is a problem. It's $24 billion a year. That ... means there are mispayments, overpayments, payments to people that don't qualify or aren't eligible but still nevertheless get it. That's why I think you need to do it monthly. I think there are ways of cleaning up the fraud, making it work better and basically making it more of something that people see it makes work pay on a paycheck basis, not on an annual basis. So yes, I think our party can embrace this. I'm the leader of my party and I'm actually one of the people proposing this. But I think ultimately these things need to be bipartisan. Ultimately I think these ought to be bipartisan. And the people we partner with in local communities typically are Democrats. You just passed a bipartisan bill to deal with opioid addiction. It's a problem that lots of people are concerned about. I have one question about it, though. This bill focuses on treatment, not on criminal punishment. Some people have raised questions about that, about whether there's been a double standard over time. In the '80s when there was a focus on drugs in the black community, people focused on prisons. Now people are concerned in the white community, and it's about treatment and public health. What's happening there? No, I think you need to complement this with criminal justice reform. I agree with that, as well. That's something we're working on for September. We've got four bills on criminal justice reform already out of the Judiciary Committee. We're looking at getting two more out. Just this week I set up a working group of members from both sides of the aisle to work on community policing ideas, training ideas, but also finishing the job on criminal justice reform so we can get all of those bills out to the floor in September. So, opioid abuse is an epidemic in America. This was a fantastic effort of Republicans and Democrats coming together to solve this problem which, as you say, it's about treatment, it's about intervention, it's about recovery. In the 1990s, to your first point, I think government, both Republicans and Democrats, overcompensated on our criminal code. And we went too far and there are disparities — crack cocaine vs. powder cocaine — there are clear disparities and more importantly, I think that we've learned there are better ways of dealing with some of these problems than locking up somebody for 20 or 30 years. You end up ruining their lives, ruining their families, hurting communities, and then when they try to re-enter into society, they're destitute. So I really think there are better methods of dealing with these problems, and I think that is part of criminal justice reform. I think that's something I put out in the poverty plan that I first authored three years ago. So we intend on bringing these bills up in September. Some people will know that you support broadly free trade and trade agreements. Donald Trump, your party's presidential candidate, broadly speaking has criticized them. You clearly believe that free trade is better for economic growth. If Mr. Trump is elected, if his policies lead to trade wars, will there be more people in poverty? Well, yeah, I don't think big tariff — I've been pretty clear about this — I think massive across-the-board tariff increases basically just raise the prices on consumers, start trade wars. I think the smart way is to border adjust our taxes, like we're proposing to do with "Our Better Way" tax reform. I also think it's important that if we're going to lead in the global economy and the 21st century then we have to get the rest of the world to play by our rules in the 21st century global economy. And the only way to do that is to get good trade agreements. I'm not sure if that means that you agree necessarily on this issue. I don't know if it agrees, but the fact that he says he wants trade agreements — just good ones — I think tells me that he's not against getting trade agreements. It's just the quality of the trade agreements he wants to get. And that's fantastic. I want to go get trade agreements, because if America walls itself up, if we address sort of an economic fortress America, we will lose. Look, it's pretty easy to see why. Ninety-six percent of the world's population does not live in this country. We are a mature economy. If we want to have good jobs and faster wage growth, we have to make more things in America and sell them overseas, because 96 percent of the world's consumers are not in our country. And, oh by the way, all these other countries are going around the world and getting preferential trade agreements among themselves, leaving us on the outside looking in. So that is a problem. If we stand still on trade and do nothing, then Europe, China, and the rest will go around the world and get better trade agreements and freeze us out of those markets that we're already in today. Let me give you an example: I come from Wisconsin. We pride ourselves on making and selling cheese. Europe is going around the world getting the rest of the world to agree to Europe's cheese regulations, we call it geographic indicators. Europe is saying you can't buy Swiss cheese or feta cheese or Parmesan cheese or Gouda if it doesn't come from those specific areas in Europe — meaning the Wisconsin Swiss, Parmesan, and feta and Gouda we make, they're getting trade agreements that would freeze us out of those markets. That's ridiculous. And so we have to go around the world and fight to make sure that these rules are clear and fair so that American cheese-makers in Wisconsin can still have markets. Because I love to say that we eat a lot of cheese in America, but we can't possibly consume all the cheese we make in Wisconsin. Just an example. Hillary Clinton opposes these things, yeah. Well, that's what I'm asking. Have you lost the country on this one? I think we're in tough economic times and high anxiety and I think this is an issue that is always very difficult to sell when we have slow economic growth and flat wages. I think we get faster economic growth, faster wage growth, and we have to prove that opening up markets and getting good agreements for our country, for our manufacturers, will help get better jobs. We have more work to do, but it's really hard to talk about the benefits of opening up trade with other countries when we have a tough economy. And that's the situation we find ourselves in today. Is it remotely possible that you would approve the Trans-Pacific Partnership, which Congress would need to do before there's a new president that says they're opposed to it. Well, I don't know the answer to that question. I really just don't, because I think the president has to go back and renegotiate some key provisions in it. The provisions as they are drafted now I don't think are ready to go. So he has to go back and fix a number of the things that are in this agreement before it can be ready to be considered. When Republicans who have endorsed Donald Trump are asked about Trump, it's common for them to say, well, whatever reservations I may have he'd be a better president than Hillary Clinton. You've said that. So let's take that as a given, that point of view. But let me take Hillary Clinton out of the equation for a moment: Standing on his own, would Donald Trump be a good president of the United States? Well, it's not a hypothetical. He could be elected. Would he be a good president? We're facing Hillary Clinton or Donald Trump. And I do believe that Donald Trump would be a far better president than Hillary Clinton. I think Donald Trump will pick better Supreme Court justices. I think Donald Trump will sign better legislation into law that gets our country on a better path than Hillary Clinton. That's the choice in front of us and that is why I'm supporting Donald Trump. What does he need to change to be a good president? Well, you know he and I have talked about this. I think — I just think improving temperament and inclusive rhetoric, and an agenda that invites people into our party is something that I think anybody going from a primary to a general election needs a transition. I find what happens is both parties speak to their party bases to win their primary elections, but what I think is necessary to have a national election worthy of being a majority party, we have to sell converts to conservatism. We have to go out and explain why our principles apply equally and universally to everybody and why our ideas are better than the alternatives. This is basically, Steve, by the way, why we have a Better Way agenda. This is why you go to better.gop and you can see the things that we're talking about to improve this country. To grow the economy. To make us more secure. To restore self-government. To have patient-centered health care. To fix our debt problem. These are the ideas that I think we need to go talk to the country about and we need to do it in a way that people who are not used to voting for us or who have never voted for us are inclined to do so. So, I think better outreach that's more inclusive, I think that would be something that would be an improvement. You said the word inclusive. I spoke with a thoughtful conservative before coming here — someone who likes you very much and who says he believes that you really do care about poverty, you really do care about being inclusive and broadening the Republican Party. And then goes on to say, if you attach yourself to Donald Trump, you sink all that. Yeah, I don't see that. I don't — I'm the highest-ranking Republican in the country; I'm the speaker of the House. I have certain duties and responsibilities that come with this office and one of the primary political duties with this job is not to dis-unify our party and cut it in half and therefore guarantee that the left wins by default. Do you have any assurances from Mr. Trump about his behavior or anything that has concerned you? Look, you know I've had disagreements with him. I've made those — those are fairly publicly known. And he and I have had those same conversations. He knows how I feel about these things. But do you think he's changing anything? I believe he's going to endeavor, to try. Let me ask you about something else that gets to being inclusive and to the diversity of the country. You spoke in the House of Representatives after the shootings in the past week — very interesting speech — beginning with the long pause at the beginning as you seemed to be trying to gather the right words to say. And you talked about the need for unity. That's the need you discussed. But I want to back up one step to the diagnosis. What is your diagnosis of the problem that needs to be addressed? I think we've got communities that are not nearly as successful at merging the community and law enforcement as others are. I think from what I can tell from listening to friends in the minority community who talk about this, as an everyday problem, that there are solutions out there that have to be gotten to that other communities haven't replicated. I was talking to my friend Buster Suarez, who is a black pastor in Somerset, N.J., [at the] First Baptist Church there. Buster and the other black leaders in Somerset, a low-income community, worked with local law enforcement to set up a group that has instantaneous communications whenever something wrong occurs. And they've got — they've really basically fused and merged the minority community with the police department in a very effective way and they have a community policing system that works really, really well. OK, that's not happening in all parts of America. So what I get out of that is: Let's go learn from those, let's go look at those solutions and let's make sure other people know about it and try and replicate these success stories. So what I get out of this is, we need to learn and listen to people who are hurting, who believe just by the very color of their skin they don't get treated fairly with respect to law enforcement. The fact that so many people believe that is a problem in this country. So let's understand that, and then let's go find out where they've solved that. And then let's try and replicate that. That's one of the reasons we formed this working group this week. Dave Reichert, good example, was a sheriff in Seattle. I talked with members of the black caucus who are representing these views. Who are representing their constituents. So what we're trying to get are people with law enforcement backgrounds here in Congress, people who represent minority communities, especially young black youth, to come together to say where are we, where can we help with community policing? Where can we help with getting these solutions spread and passed around? And where can we get law enforcement training improved so that we have good training that's going around the country so that these kinds of problems don't get out of control? You said that people of color believe they're less safe, that they feel they are less safe. When you look at the statistics is it clear to you that people of color actually are less safe? Well, yeah, I take them, look at Tim Scott. I take him at his word. I mean, Tim's a buddy of mine. Did you see that speech he gave on the floor the other day? South Carolina senator, you're saying. Yeah, sorry, I should've explained. Yeah, I think statistics — I won't go into statistics because I don't have them off the top of my head, but I do believe that this is a problem because people are telling me it's a problem and I believe them. Here's something else that I've heard about you. Somebody who's interested in policy was saying, expressing the belief, that you're a policy guy, that President Obama's basically a policy guy, and they said if Obama and Ryan could just close themselves in a room, they would work everything out or a lot of things out. Do you believe that that's true? Well, we differ on so many things from just a core philosophical standpoint. So let's just take, say, budget. Or entitlements — health care, in particular. I don't think that's true. He and I have just such divergent beliefs on how the health care system ought to be organized. I think the tax code — I mean, I've had a lot of conversations with him about these things. I do believe though we have been able to endeavor to find common ground. Look at what we've gotten done in the last seven or eight months. Opioids, we just signed that into law today. Or we sent that to the president today. We had the biggest transportation bill since the mid-1990s. We had the biggest K-12 education reform in 25 years. We rewrote all of our customs laws. We're in the middle of making great progress on our cancer legislation. The president calls it the "Moonshot"; we call it "The Cure." It's the same thing. So, Puerto Rico's a good example. Puerto Rico is in dire trouble. The president and I have spoken about this issue many, many times. And we did and we worked together. And he and I talked quite a bit about this, about Puerto Rico legislation to put Puerto Rico on a good track. So where we could find that we could find room for common ground, we've done that and we're doing that. We actually are doing that right now. We just passed mental health legislation here last week. Huge bipartisan vote rewriting our mental health laws for the first time in a generation. I think we'll get that into law. I see a real chance at that outcome. So what I've discovered in this job or I've tried to do in this job, go find those places where there can be common ground. He and I have spoken about these things many times. But then there are just going to be issues where we just don't agree. And I just described a couple of them like health care or tax legislation and others. Criminal justice reform is another one that he and I have talked about where I hope we can get consensus. I think we can, but the Senate's a tough place to work with these days. But I think that's another issue. I guess the answer: Sometimes and not other times. Gotcha. Gotcha. I want to know if there's going to be common ground on guns. There's a particular detail of this I'd like to know. I know there's some legislation you've discussed that you've pushed back to September. I would like to know if there is something on the subject of gun violence that in the interest of unity you're willing to embrace even though it would be very difficult for you politically or otherwise. You're talking about the terrorist watch list denying them weapons. Yeah, anybody can be placed on these watch lists and there's no due process. So we cannot give the power to bureaucracy to unilaterally suspend a person's due process rights. That is something that I would like to think people from all sides of the aisle would join us in defending. But having said that, let's take a look at the fact that if there is someone on a terror watch list and they go try to buy a gun, do we want to make sure that law enforcement has the tools to prevent that sale from occurring if they think it's a threat, of course we do. I mean, of course we do. That's what we're trying to figure out, which is how do we give law enforcement tools they need to stop a person from getting a gun who is on one of these watch lists without denying a person their due process rights. And that's what we're trying to get right. What the FBI also tells us is be careful how you do this so that you don't tip off people that they're on a watch list in some cases. That's the other thing we have to worry about, which is there are a lot of terror investigations out there where people don't know that they're subject to a terror investigation because they're trying to get their fact pattern, they're trying to get the networks figured out. So we want to make sure that we get this right. There was an attempt here to rush something through law and we don't want to screw up terror investigations, we don't want to mess with people's due process rights, we want to get it right. And that's why I find in all of these issues — this is my 18th year in Congress — if you move when the issue is so passionate, you often get critical details wrong and you end up doing things that you have to fix later on. So I'd rather just figure out how to get this done right and that's what we're trying to figure out right now. One other thing Mr. Speaker, we're talking as Donald Trump is preparing to announce his vice presidential choice. I presume you don't know who it is? However, you know what it's like. You're the last person to do this. If the nominee, the choice, were to call you for advice, what would you ask? What would you suggest? Oh, if it's — you mean, if the running mate were to call me? What is your advice for Donald Trump's running mate? I would basically say, be yourself. The first wave is, they come and try and sort of — what happens is, if you're going to be picked, you're going to be a person that vets well. But nevertheless, everybody, they're going to sort of dig through your life. Just know that's going to happen, be prepared for that. Get thick skin. As you get thick skin don't make it impermeable skin. Don't lose who you are, don't lose your personality. And then, what you end up doing is you worry, you don't want to screw up. You don't want to undermine the campaign. Don't become too overly scripted. Make sure that you're actually naturally yourself. And just represent yourself in the way you want to. The one thing that I sort of — you know, looking back at it is, I think, so many events are so canned. So many events are so scripted. And, by the way, they're with just your supporters. I think it's really important that in presidential campaigns, we try to get a little outside our comfort zones. We get out of just doing rallies. And we get out into the country to speak with nontraditional voters who aren't used to seeing Republicans and who haven't heard our message. And that's the kind of campaign that I think we ought to have, I wish we would have. Not just as Republicans, but just you know, we would see in America. And I would encourage that running mate to do that. What do you mean nontraditional Republicans? Do you mean minority groups? Yeah, going to the minority communities. Go into the inner cities. Go into bastions of Democrats and present your case. Give people in this country a flavor of what our ideas look like. And basically for the running mate, you got a few things you gotta do right. You got to give a good speech at the convention. You got to have a good debate. So you can't mess those — and, oh, you have to have a good launch day. So ... basically three things: Launch well, good speech, good debate. And then help that nominee — and the other thing that actually occurs is there's a transition occurring in all of this. We have a law that you basically set up a shadow government so to speak, which is our government preparing to govern should you win. I spent a lot of time on that with Mike Leavitt, who was our head of transition. Spend time on that. Once the running mate is done with his or her debate, you've got a good month there. And you need to focus on that transition so that if you win you've got everything working in the right direction. So I hope he picks someone that is a good conservative that has some experience that can help him govern, that can help him set up a government. And that's something that person has to put a lot of thought into and some time and attention to. And also just sort of be yourself. That's the last thing I would say is just be yourself. Mr. Speaker thanks very much.